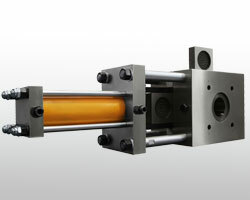 Bart screen changer manufacturers R & D and production of a new screen changer: extruder continuous screen changer. The main structure comprises a main body and a mesh block arranged in the mesh block groove, and a pressure sensor is respectively arranged at the front of the mesh and at the back of the mesh. The utility model is characterized in that the material channel in the main body is a plurality of channels. Extruder continuous screen changer has a number of material channels, blocks work at the same time filter block, and thus filter large, high efficiency, for a long cycle, and every screen for all used mesh filter block Out, there is no stage after entering the leisure state, also avoid the overheating decomposition of raw materials, replace the filter block of the remaining material without cleaning, direct replacement of the new filter can be used. Extruder continuous screen changer mesh screen for its work, high efficiency, high cost advantages. Many domestic provinces and municipalities in the area have a successful case site, you can lead the user to visit the field, please call our website above 24-hour service hotline.